This year's Christmas production by the Library Theatre Company in their temporary home at The Lowry Theatre is A Christmas Carol. I’m not a connoisseur when it comes to Dickens, and I confess a little shame-facedly, given that I am reviewing a production of his work here, to having never read one of his books from start to finish. I own quite a few of his works, and have started and re-started many of these plenty of times, and almost finished one or two. I could probably recite the front page of several right here, right now. And yet despite not being sufficiently well-read in the Dickens Department, I can reel off and bring to mind many of the characters from his vast collection of works without effort; Fagin, Oliver, The Artful Dodger, David Copperfield, Uriah Heep, Pickwick, Micawber, Scrooge, Little Dorritt, Mr. Bumble, Nancy, Bill Sikes, Pip, Magwitch to name but a few. This is because of course, the work of Dickens has been made into hundreds of popular films, TV serials, musicals and theatrical productions and I have got to know a version of Dickens by watching other peoples’ interpretations and adaptations, rather than by reading from the original script. I’m probably not alone, and possibly in keeping with the times, when “literature-lite” is the order of the day in most schools where students take their “classics” in bite-sized chunks if they take them at all. Like an alcoholic at a meeting of the anonymous, now I’ve confessed to my failings, I can begin to put things right, starting with the subject of this review at a most appropriate time of year “A Christmas Carol”, one of the best loved Yuletide books in the world. It’s not that I don’t enjoy Dickens, quite the opposite; how could one not appreciate prose like this, the first few lines from “A Tale of Two Cities”? “It was a Sunday evening in London, gloomy, close and stale. Maddening church bells of all degrees of dissonance, sharp and flat, cracked and clear, fast and slow, made the brick-and-mortar echoes hideous. Melancholy streets, in a penitential garb of soot, steeped the souls of the people who were condemned to look at them out of windows, in dire despondency. In every thoroughfare, up almost every alley, and down almost every turning, some doleful bell was throbbing, jerking, tolling, as if the Plague were in the city and the dead-carts were going round”. His writing is florid, evocative and poetic and whilst TV and music bring the iconic characters that Dickens created to life, they are not always accurate or a worthy substitute for the mesmerising words on the tens of thousands of pages he wrote. The TV and stage productions are only engrossing because the stories are brilliant to begin with and the characters so engaging - Dickens was without doubt a great story-teller. The combination of a great story with absorbing characters and some excellent big-screen adaptations mean that for many, Dickens’s Oliver will forever be personified in the young and angelic Mark Lester. Ebenezer Scrooge will live on with the visage of Alastair Sim who had the perfect pasty pallor, measly mannerisms and facial contortions required of such an old-misery-guts. And could there ever be another Fagin to match the one portrayed by Ron Moody? Although I can’t imagine that Charles Dickens could ever have conceived of his Fagin singing “you’ve got to pick a pocket or two”! A creative genius in its own right or an act of atrocity against literature? Well that depends on your particular perspective. Dickens was the most popular English novelist of the Victorian era, and is still admired all over the world today so much so that his novels and short stories have never gone out of print. He is responsible for creating some of English literature’s most memorable stories and characters. He wrote at a time when Britain was the major economic and political power in the world and in his writing he exposed the life of the poor and disadvantaged, whose desperate lives had been largely ignored in the race for profit. He regularly depicted the exploitation and repression of the poor and condemned those that got fat on the proceeds while allowing such poverty to exist. His writings inspired others, including Karl Marx, who said, “Dickens, and the other novelists of Victorian England,...issued to the world more political and social truths than have been uttered by all the professional politicians, publicists and moralists put together..."
He also campaigned through his writing on many issues—such as sanitation and the workhouse—but it was through his works of fiction that he attracted the biggest audiences to the issue of inequality. It is no mean feat to combine social commentary, a critique of the poverty and social stratification in Victorian society with engrossing and entertaining characters and stories, which is why his work is greatly admired. Many writers have incorporated autobiographical elements in their fiction, and Dickens is no exception. 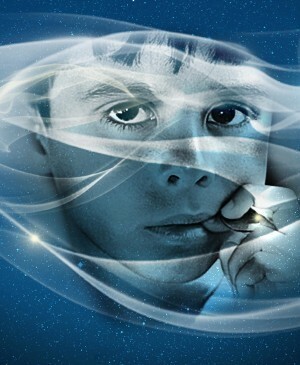 “David Copperfield” is one of the most clearly autobiographical as are scenes from “Bleak House” of court cases and legal arguments which were drawn from Dickens’s brief career as a court reporter. Dickens's own father was sent to prison for debt, and this was a common theme in many of his books, with the detailed depiction of life in prison in “Little Dorrit” taken directly from Dickens's own experiences. “Nell” in “The Old Curiosity Shop” represents Dickens's sister-in-law and “Wilkins Micawber” his father. The snobbish nature assigned to “Pip” in “Great Expectations” is based on how the author saw himself at a young age before debt changed the family trajectory. His life was tragically short by today’s standards, although the volume of work he produced would suggest otherwise, and he died aged 58 after a series of strokes left him fragile and vulnerable. 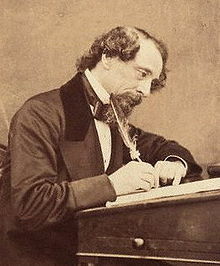 Despite his reputation and mass appeal, not everyone appreciates Dickens, and he has been criticised for romanticising his characters and depicting sentimental scenes that contrast sharply with the harsh reality in which he set his stories. The “poor but happy” cliché is in evidence in several of his novels. His characters are sometimes somewhat caricatured, and the ugly social truths he reveals about people and life in London swathed in a Victorian smog of affection. But, he is perhaps most universally admired for the characters he created and with whom many of his readers identify and came to know and love. These characters need no introduction and leap off the page and grab, engross and stay with you long after you have finished the book. Some of them have whimsical names that hint at the roles they play, such as “Mr. Murdstone” in the novel “David Copperfield”, a combination of "murder" and “stony coldness”. The sour and stingy sounding “Ebenezer Scrooge” speaks for itself and both Ebenezer and Scrooge have become so well known as words associated with the Dickens character that they are both used separately today in common parlance as slang for a tight-wad; The term “Scrooge” is now totally synonymous with miser and is described in the Oxford English Dictionary as “someone who is mean with money”. Tiny Tim, Jacob Marley, Bob Cratchit, Oliver Twist, The Artful Dodger, Fagin, Bill Sikes, Pip, Miss Havisham, Charles Darnay, David Copperfield, Mr Micawber, Abel Magwitch, Samuel Pickwick, Mr. Bumble, Nancy, Uriah Heep and many others are so memorable and well known that they have taken on a life of their own outside of the original novels. Many people don’t know that in “A Christmas Carol” Dickens was also responsible for introducing some of our best known and well used Christmas phrases and practices. “Merry Christmas” is now a popular expression and “Bah Humbug” a much used derogatory remark for those less festive in spirit has become part of our language since Dickens first penned it. The Christmas Turkey and family gatherings depicted in this novel are now habitually associated with Christmas; the influence of Dickens is far-reaching and still in evidence today. “A Christmas Carol” stands as Dickens’s best-known novel, with new adaptations almost every year, and is the most-filmed of his works. It was one of several Christmas themed tales produced by Dickens, which included the less well known; The Chimes, The Cricket on the Hearth, The Battle of Life and The Haunted Man. For those of you who may not know it (is there anybody who doesn’t? 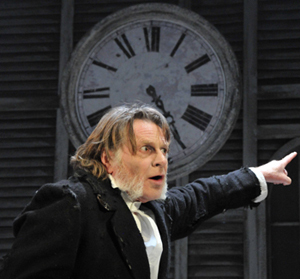 ), it is a Victorian morality tale of an old and bitter miser, Ebenezer Scrooge, who goes through a profound experience of redemption. 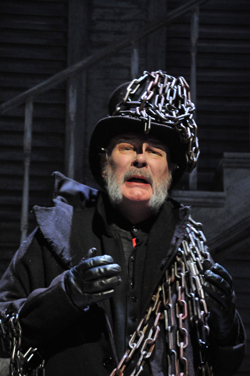 On Christmas Eve, Scrooge is visited by the ghost of his dead business partner Jacob Marley. Marley has been condemned to an eternity of walking the earth burdened by a heavy chain, each link representing his cruel and misanthropic deeds and his own miserly existence before his death. He visits Scrooge to show him what will happen to him if he does not change his miserly ways, and to try and show him how to avoid this terrible fate. Scrooge is sceptical and retires to bed, but during the night is visited by the ghosts of Christmas “past, present and future” who “open his eyes” to the error of his ways, and make him realise that he desperately needs to love and be loved and to show compassion to his fellow men. By the time he wakes up on Christmas Day, Scrooge is transformed and reverts to the generous and kind-hearted soul he once was in his youth, before life’s twists and turns and the pursuit of personal profit ate away at his very soul. Overwhelmed by what the ghosts show him and by the chance to redeem himself, Scrooge rushes out into the street hoping to share his newfound Christmas spirit with everyone. He sends a giant Christmas turkey to the household of his impoverished, hard-working and good-hearted employee Bob Cratchit and attends the party of his nephew. He begins a new life of treating his fellow humans with kindness, generosity and warmth and in the process his own life is transformed for the better. The tale sums up (for many) the true meaning of Christmas. It eclipses all other Yuletide stories in popularity, not only because of its moral message and universal human values, but also because of the typical and easily recognisable characters of Scrooge, Tiny Tim, and the ghosts. Unfortunately though, these characters and antics have not been left behind in the Victorian era or confined to the pages of a Dickens novel. They are well and truly alive and kicking in the 21st century. There are still far too many “Scrooge-like” employers making their staff work longer, harder and for a lot less, even during the so-called “season of goodwill” using the latest Capitalist crisis as an excuse to wield the axe. If at Christmas these modern-day scrooges give their employees a day off, it’s only because hard-fought-for legislation exists which compels them to. You can bet your life that without it, there would be many a “Bob Cratchit” sitting at a desk, or stacking a shelf somewhere in the freezing cold while all around him ring the bells from till and church in the rush and mix of Christmas from which he is excluded. Not much different from what many are being told today – get in earlier, work harder, work for longer and for less …. And by the way, no Christmas party this year - we can’t afford it! A Christmas Carol has become as much a part of the Christmas ritual as putting up the ubiquitous fairy lights that dazzle in the darkness and seem to multiply with every year. I know this tale by heart having experienced it often and in a range of media, and also because I re-visited the book prior to taking up my seat in the functional Lowry Quay Theatre. So, just for a bit of a change I put on my reality-tinted specs, flicked on the time-travel switch in my head and imagined the whole story as if set in the 21st century. There in my minds eye was this enduring tale, but in a modern day context accompanied by the most haunting music and choral singing, especially composed by Conor Mitchell and played live throughout by Isobel Waller-Bridge, sitting stage-side; one of the most enjoyable features of the whole show. In place of Ebenezer on stage, ably depicted by David Beames (a well credited Royal Shakespearean actor, and the lynchpin of the show); I saw instead the figure of George Osborne, rubbing his hands in glee while counting up the beans – “Oh! But he was a tight-fisted hand at the grindstone, Scrooge! A squeezing, wrenching, grasping, scraping, clutching, covetous old sinner!...he carried his own low temperature always about with him; he iced his office in the dog-days; and didn’t thaw it one degree at Christmas.” If ever there was a man more perfectly suited to the role of Ebenezer it is George Osborne, who relishes every miserable measure of austerity he imposes on us. And it was Nick Clegg I saw, embodied in Marley (played earnestly by Claude Close) entwined in the chains of his mis-demeanours, broken promises, lies and betrayals; “I wear the chain I forged in life. I made it link by link, and yard by yard; I girded it on of my own free will, and of my own free will I wore it”. He said as he recalled how he backtracked on tuition fees, welfare benefits, immigration etc etc etc each link engraved with a broken pre-election pledge. As the spirit of Christmas past approaches, it is “light one instant, another time dark...fluctuated”. Who could this be? OMG! It’s him I realised, as he oscillated in the depths of the darkness after another of his infamous mood-swings… It is the former PM, Gordon Brown, emerging slowly from behind the curtain. “I told you these were shadows of the things that have been... that they are what they are, do not blame me!” He said, as he stood over the empty coffers he had left behind, and stared into the face of “that woman” Gillian Duffy, haunting him like his very own spirit from the past. While this particular adaptation did not bring anything new to the audience (except for those with 21st century specs like me), it remained true to the narrative of Dickens, was a breath of fresh air and a welcome change from the over-produced all-singing-and-dancing versions I have seen before. It provided a much needed less-frenzied and dare I say it, possibly slightly more intellectual addition to the usual fare of dumbed down pantos starring faded celebrities that get offered up in theatres up and down the country every Christmas season. So, congratulations to the Library Theatre for trusting this timeless story, respecting the audience, not playing around with it too much and demonstrating why Dickens remains relevant today! The gothic set was huge and impressive providing an eerily spooky setting for the three spirits to float around in. The ghost of Christmas future a large skeletal and otherworldly creation draped in swathes of white gossamer was I thought, the only convincing spirit of the three; the other two just looked like women in fancy dress. The enormous door in the centre of the gothic monstrosity of a building, served as a screen on which to project several computer generated landscapes through which Scrooge is transported on wires, led by each of the spirits on his journey towards enlightenment. At the Christmas party held by Scrooge's young nephew, I was reminded why I’m much more at home in the modern world, as the party-goers got excited, enthused and delighted playing a game of blind mans buff – that was entertainment?! But what of the spirit of the future? Could it all end as happily as Dickens wrote? Well unfortunately not if you’ve got your 21st century specs on and the coalition is still in power… ”Oh ghost of the future! I fear you more than any spectre I have seen!” says Scrooge. The phantom – aka David Cameron - slowly, gravely, silently approached... in the very air through which this spirit moved, it seemed to scatter gloom and mystery. It was shrouded in a deep black hoodie and difficult to detach its figure from the night and separate it from the darkness by which it was surrounded”. After Scrooge had seen what this spirit of Cameron had to show him, he said “this is a fearful place”… this broken Britain, this big society. Dickens wrote of redemption, hope and a prosperous future for all, but I fear that Cameron, Clegg, Miliband and co. will not provide the same. So, it was with heavy heart, through 21st century, and by now misted over specs that I saw poor Tiny Tim limp off to carry out his community service because his benefits had been withdrawn and he had been assessed as fit to work for a minimum wage. Old and work-weary Bob Cratchit (played graciously by Salford local Jack Lord), up even earlier than ever as he struggled to get to work on time, because the transport system had long since been closed down to “encourage” people to find environmentally-friendly travel alternatives. He now walked miles to work in order to avoid the planet-tax imposed on “carbon creators” by the Government. With his pension pot plundered, and a pay cut imposed, he worked harder and spent longer in the Scrooges cold and dilapidated office than ever before. Poor Mrs Cratchit (played with motherly warmth by Abigail McGibbon) now stuck at home all day in temporary housing with the youngest child who could no longer afford to go to school since the introduction of fees for all, from cradle to grave were introduced to pay off Britain’s deficit. She struggled to manage on a reduced budget especially since rationing had been introduced to “encourage” the poor to eat more healthily. She could now no longer buy cheap, tasty and filling food at the supermarket and had to spend hours tracking down the racketeers selling these foods at marked-up prices and avoiding arrest by the “managing menus support officers” for possession of “junk food”, which was now a criminal offence. And what of old Scrooge? Well, he’s still counting up the piles of profit, in pounds, euros, dollars, yuan and rupees oblivious to the misery of others around him. But back in the real world, with specs abandoned, all is not lost. Some of us at the Manchester Salon can still imagine a very different and much improved 21st century for everyone. We meet regularly to discuss our ideas and to challenge mainstream thinking and welcome others who have something to say about the future direction of society. Next discussion is looking at the issue of relevance in appreciating poetry - click on Poetry: its relevance and beyond. So for now, in the best tradition of Dickens, we would like to wish all our readers and supporters a very merry Christmas and a prosperous and combative new year!